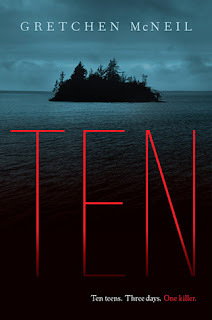 Gretchen McNeil's Ten is a creepy and intense thriller with plenty of twists and a heap of suspense. The story is told from the point of view of Meg, who is an admirable protagonist dealing with an unhealthy friendship with her best friend Minnie. Right away readers can tell that it is a sticky situation, and Meg is in the unenviable position of having to placate Minnie at the risk of her other relationships and her own happiness. McNeil does a good job at balancing out Meg's drama with Minnie and their past issues with their present at the beach house, the dynamics between the other eight guests, some of whom the girls know and some of whom are strangers, and the steadily building sense of dread caused by the creepy atmosphere. Once the murders begin, the book is constantly moving, hurdling to a surprising and dramatic ending. 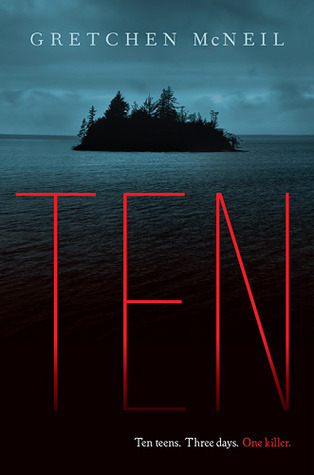 Ten has all of the classic elements—a killer bent on revenge, a tentative romance, secret identities, and hidden diaries—that make it a harrowing but deliciously dark read. A few of the plot elements do require a slight stretch of the imagination, but overall McNeil has written a creative and immersive read that will have you racing to the end. Cover Comments: I love, love, love the creepiness of this cover! The red of the title really stands out against the dark blue of the island, ocean, and the sky. It's so lonely and foreboding. I adore it. This one will be out on September 18th, 2012! Excited to see a review of this as I love the original Christie novel and have been wanting to know how things are twisted to make a new story. It does sound and look very, very creepy! :) Like a scary movie! I'm really intrigued! thanks for the review. This book looks sooooo good! I'm always on the lookout for a good, creepy read -- and one that sounds like it's based on Agatha Christie? It's gotta be good! I have TEN on my reading list. I love any book that reminds me of a great Agatha Christie read. The Casual Vacancy Has a Cover!